Samantha (Sam) James is a mess. She is an alcoholic, a complicit partner in domestic abuse, and completely unstable. She knows this about herself even as she continues to drink, date her boyfriend, and show up at work sleepless and incapable of clear thought … night after night and day after day. Sam has little or no self-worth and believes that this is the only life to which she is entitled. Her working hours are spent trying to save other people as a way to redeem and save herself. She is the top psychologist at Typhlos, a psychiatric institution in Manhattan, and the last stop for hard-to-reach psychiatric patients. She prides herself in her ability to fool all of her co-workers, her boss, her patients, and her best friend, David, while maintaining her status as a superhero on the job. This is a compulsive, engrossing, and outstanding debut. 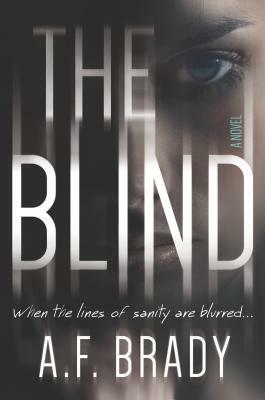 A razor-sharp debut about a woman who goes so far off the deep end, she might never make it back up...Sam James has spent years carefully crafting her reputation as the best psychologist at Typhlos, Manhattan's most challenging psychiatric institution. She believes if she can't save herself, she'll save someone else. It's this savior complex that serves her well in helping patients battle their inner demons, though it leads Sam down some dark paths and opens her eyes to her own mental turmoil.When Richard, a mysterious patient no other therapist wants to treat, is admitted to Typhlos, Sam is determined to unlock his secrets and his psyche. But she can't figure out why Richard appears to be so normal in a hospital filled with madness. As Sam gets pulled into Richard's twisted past, she can't help but analyze her own life, and what she discovers terrifies her. And so the mind games begin. But who is the savior and who is the saved?In this unexpected and addictive psychological debut, A.F. Brady takes readers into the psyche of a deeply disturbed woman desperately trying to keep her head above water, showing that sometimes what's most terrifying is what exists in your mind.